Oceanfront, beautiful, private property you have all to yourselves. RENTAL has 2 options between 1 & 2 bedrooms. QUOTE generated by site is for 1 bedroom. Even if you rent just the main house, the detached master remains locked up. We wont rent to another group at the same time. If you are interested in both sides let me know and I will adjust quote. The online system wont give the correct amount if you want both sides. Enjoy breathtaking unlimited views of nearby islands, sensational sunsets, turtles feeding year around and whale watching in Winter from your own private paradise. Our irresistible home is located on private property, surrounded by fruit trees, gardens and lush green grass in Makena Maui. It is one of the finest, truly unique hidden Hawaiian places. You have 2 options when renting our place. You can either rent the main house which sleeps 2, or the main house and detached master suite which sleeps 4. Because of this option its hard for the rates to come up correctly with this site. Just send me a quote request and I will get the correct rate back to you. Decorated in casual island style, the homes main dwelling has 1 bedroom with queen bed, 1 full bath , living dining room combination with a full size kitchen. Attached to the main home is a private master suite with a queen bed, full bath, sitting area and hot tub with beautiful ocean views. You can rented the cottage for 2 people or the cottage and master suite for 4 people. Maximum 4 guests total. Amenities included are barbecue, cable TV/VCR/DVD, stereo with CD/tape, cordless phone, and washer/dryer, ceiling fans, fully equipped kitchen with coffee maker, and microwave. Things to do...: Take advantage of the excellent snorkeling and scuba diving in front of your own cottage. Feed the fish in the tide pools or search for sea shells. Look for turtles eating the seaweed off the rocks as you sit in your lounge chair. There is not a better place to kayak on Maui and they are available to rent nearby. Walk to nearby white sand beach - Makena Beach. Big Beach, which for years has been voted best beach in Hawaii, is a 5 minute drive from the cottage. If you dont feel like cooking enjoy the wonderful restaurants at the Maui Prince Hotel which is a 5 minute scenic walk. Keawalai Historical Church is located just 5 doors down. Makena Memories: Our home has such wonderful memories for me...My grandparents originally built the little cottage as a place to come to on the weekends. My first memories are of the original design of the house...it was completely open on the front. Where the bedroom is now, had benches all the way around the sides. In the middle where the bathroom is, was where they locked up the bedding and cots. The kitchen was the kitchen and the bathroom was actual built next to the cottage and my grandfather kept his most precious possessions in there...his lawn mower and fishing nets. We had so much fun, everyone together like a big camp out, some in hammocks others on army cots, but all of us watching the fireworks in the sky. What I realized as I got older was that it wasn't fire works but the military bombing Koholawe island. Through the years I learned how special our place is. I grew up there, learned to swim, got married there and now my son gets to experience it too. My name is Wendi and I was born on Maui in Kula. Every weekend we as a child we would come down and spend it in Makena. It is a very special place to me and I know as soon as you visit, it will become one for you too. We are not a hotel or condo, but a little slice of heaven. I try to make sure that your stay is a special one. I can talk about it for hours so if you call, make sure you have some time! I dont offer online booking because Id rather get to know my guest and make sure they feel comfortable with renting from us. This property has been in my family for 3 generations and will stay in my family for many more. My grandmother use to say Makena means work' and I didn't understand until I was older how much I was willing to work to preserve our little slice paradise. Waking up to the sounds of the waves on the shore. Having coffee while watching the turtles feed off the rocks. Picking mango's and bananas right from the trees for breakfast. Its not a condo...its your own place to enjoy. The bath in the main house also has lots of closet space for clothes. In the master suite you can sitting in the jetted tub and enjoy the ocean view and sunset. Not a condo but a home located on a small dead end street. Enjoy lots of privacy and no traffic. Walk to the beaches located to the right or left of us in minutes. Pass the historical Keawalai church. Our home sit right on the water. Enjoy the views, sunsets and turtles all day every day that you are there. We have a lot of guest that have left snorkeling gear, boogie boards and beach mats at the end of their visits. We are never certain what will be left so always check out the equipment shed before you plan to go buy something. House policies: 1. In consideration to others please do not smoke in the house. 2. Quiet hours are from 9:00pm to 8:00am during which time the noise from the house shall not unreasonably disturb adjacent neighbors. 3. During non-quiet hours, sound that is audible beyond the property boundaries shall not be more excessive than would be otherwise associated with a residential area. 4. Amplified sound that is audible beyond the property boundaries is prohibited. 5. Vehicles shall be parked in designated onsite parking. 6. No parties or group gatherings other than registered guests shall occur. 7. The shoreline area is the property of the people of Hawaii and is open for free use by everyone. Your own house, private, quiet. We had a great 10 days here starting with freshly picked bananas and coconut the afternoon we arrived and an ongoing supply of mango and limes from the garden. Great sunsets every evening and turtles to entertain us. We had been concerned about the lack of air conditioning but opening windows and vents gave a great cooling breeze through the whole house augmented by ceiling fans so heat was never an issue. The snorkeling is great and there is a sand beach two houses down where it is easy to get in/out of the water if the waves against the rocks make you nervous about swimming directly from the house. Everything you need is provided to fulfill your dreams of a relaxing island vacation. We're still homesick for this amazing place! South Maui is lined with huge, upscale hotels--to find a place like this is truly unique. Excellent snorkeling just a short walk away in both directions, mango a day falling off the tree just ready to eat, mix of sun and shade. We saw a turtle swimming right next to the shore. If you'd like a place to unwind that's close to good restaurants, snorkeling, swimming, boogie boarding, etc., look no more! Hotels with oceanfront views may be your idea of ideal Hawaiian vacation accommodations, but this property opens up a new paradigm. 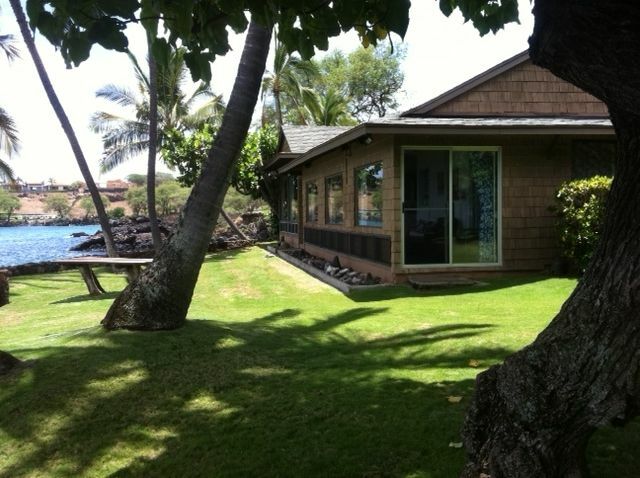 The Mauibeachcottage is private, with enough grassy area in front of the home to spread out, lounge, or BBQ, while providing private access to the water for snorkeling. The kitchen, living area, bathroom, and bedroom are comfortable enough that we never felt the need to leave the property to get out. This is the opposite of our hotel experience; no matter how nice the amenities a hotel has, we feel that staying in the room all day is wrong. Not so here.....this has everything we want minus the daily housekeeping services. Shopping and restaurants are very close within a few minutes driving. The proprietors are extremely nice and helpful, namely Wendi! Looking forward to coming back again and again! Simply paradise! The cottage is an ideal peaceful location, close to beaches and resturants without the bussel of the resorts. The view is unparalleled. Our hosts were gracious and attentive. Mahalo Brandt family!